This past week brought two great shows to Sokol Auditorium in Omaha, NE. On Monday, July 16th, Volbeat performed with supporting bands: Iced Earth, Killinger, and Dirtfedd. Volbeat, a band from Denmark, has been making their mark on U.S. soil, especially with their 4th studio album and latest, “Beyond Hell/Above Heaven.” It was a packed place on Monday night as all the bands have had a great following in the Midwest. The opener that night was Dirtfedd, a band from just down the road in Lincoln, NE. Following them was Killinger and Iced Earth. We got a chance to talk to each band that night and here are some topics we talked about with each band. Jon from Volbeat talked about how they’re making their mark in the U.S., Jon from Iced Earth explained how some member changes have affected the band, Dave and Chris from Killinger talked about their band’s energy drink called Foytonic, and Brian and Brock from Dirtfedd talked about the current Mayhem Festival they are on with Slipknot and many other big name bands. Also on Friday, July 20th, Papa Roach performed at Sokol with the local bands After the Fall and Screaming For Silence. Papa Roach is on a busy tour this year with not much down time to themselves. They’ve made it a point to try and meet many of their fans at shows by doing a special VIP meet and greet as well as others put on by radio stations. 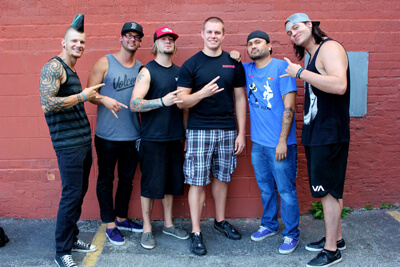 We didn’t get a chance to talk to Papa Roach but we got to do our first interview with After the Fall and second with Screaming For Silence. After the Fall talked about what they were doing to get on big shows such as River Riot and the show that night. Screaming For Silence introduced their newest member, Matt, and talked about their CD release party coming up in September. With both those shows at Sokol Auditorium in one week, it proved that Omaha, with the help from 89.7 The River, can bring in some big acts for the fans. I’m looking forward to what’s coming next for the rest of the summer toward the end of the year for shows. Check out the links below for the full interviews and photos from both nights.